In this article I’ll try to tackle as many causes as I can think of, and explain how I go about identifying the culprit of an annoying buzz. Although further increasing the relief in the neck or raising the bridge could potentially get rid of fret buzz, the problem is likely elsewhere if the guitar is already set up well and by doing this you’re just covering up the problem. 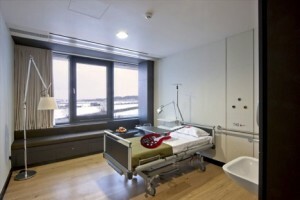 Think of fret buzz as a symptom. If you had a bad headache that lasted for a week, would you simply keep taking Advil and hope it goes away? Or would you get checked out, identify the root of the problem and target that specifically? In most cases, the “buzzing” is due to the string hovering too closely over a fret and rattling against it; hence the term “fret buzz.” Occasionally your neck might twist, a fret might pop up, or your action may just be too low causing this to happen. In extreme cases, certain notes will be beyond just a buzz and end up “fretting out”, or play as a higher note than the one you’re trying to play. For argument’s sake, let’s say the setup on the guitar is good, and by eye you can’t see any funny business in the fretwork when you sight the neck. The next step is to identify where the buzzing occurs. If a string is buzzing when played open, and the setup is good, your nut may be filed too low. Check to make sure there is sufficient clearance between the string and the first fret. Does the guitar have a zero-fret? If so, make sure the string is sitting flush up against it. The idea of a zero fret is to have the strings rest entirely on top of it. This is where the scale length begins on these guitars instead of the nut. 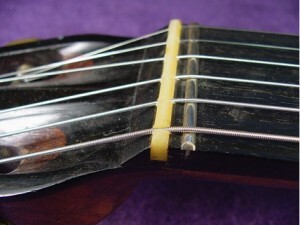 You may actually need to file the nut more so the string rests well on the zero fret to get rid of that buzz. Next to check would be the saddle. Sometimes what sounds like fret buzz could be the string rattling somewhere other than a fret. Try moving the string from its groove on the saddle, and place it elsewhere on the saddle. If the buzz stops here, you may need to file the groove a bit, or perhaps the saddle is sitting loose in the bridge. Another common culprit for buzz happens in the machine heads. Sometimes a piece comes loose inside the mechanism, creating a distinct, long sustaining buzz sound. Your best bet in this situation is to replace the machine head itself – you can likely find single ones for sale at your local music shop. If that’s not it, the string itself could be the culprit. Many times I’ve simply switched out a string, or rotated the ball end a bit and erased an unpleasant rattle. Strings that are too loose will move around more when strummed, so switching to a heavier gauge may make a difference as well. Loose screws anywhere on the guitar have a habit of causing a buzz as well, so just make sure everything’s nice and tight. So that just about does it for open notes, but what if you’re getting fret buzz when fretting a note? Fret wear, high frets, low frets, uneven frets, neck warps, neck humps and bad set-ups are all potential culprits if this is the case. The first thing is to figure out where the buzz occurs. Is it limited to just a couple frets, or all over? The best case scenario is that you’ve just got a high fret or two, and a gentle tap with a fret hammer may fix your problem. When I say gentle I mean very gentle! 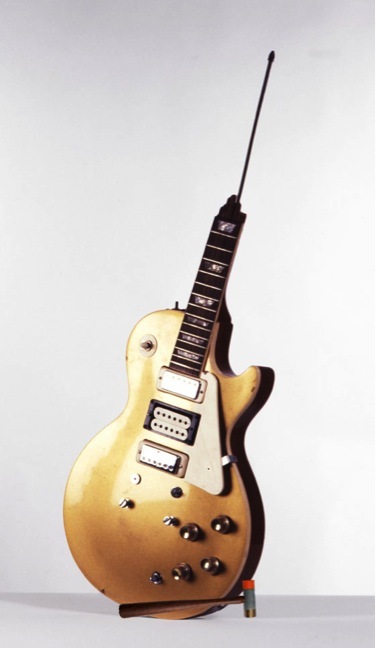 Hitting too hard could do more harm than good – the only thing worse than one fret that’s too high is one fret that’s too low. Before you start smacking things though, make sure that the fret ends of the fret in question are resting firmly into the wood, and not hovering above. If you can’t tell, just push on the fret and see if it moves like a loose tooth. If it is indeed loose, hitting this with a hammer won’t do a thing except make a satisfying “smack” sound. In this case, you’ll want to glue the fret back down to where it needs to go. Pour a small amount of super glue around the fret end that’s sticking up, then wipe any excess glue off of the fretboard and neck. Be sure to push firmly on the fret, (or clamp it if you’ve got one) and again wipe off any glue that seeps out the sides. A good glue won’t take too long to set. Sometimes you’ll need to do a lot more to fix buzz problems on a guitar, so next time I’ll talk about some methods for fret leveling and more steps to erasing that pesky buzz. Great info, as always. Thanks Vince!